Questions of proprietary surface as another on board snafus leads to an escalation of nerves amongst Chinese passengers. Define acceptable behavior/expectations? 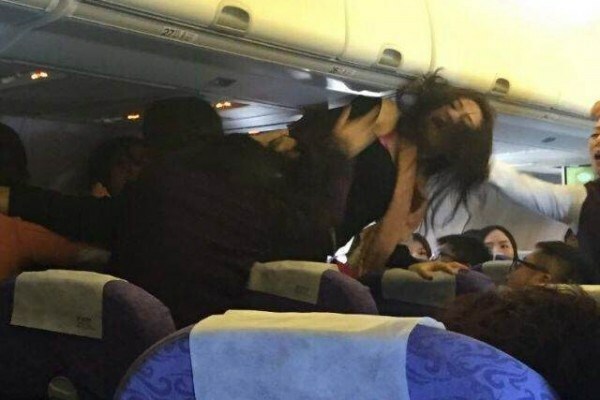 An Air China flight from Chongqing to Hong Kong was almost forced to turn back on Wednesday when a violent brawl involving four women from China’s mainland erupted in the cabin. The fracas, the latest in a string of including one earlier this week which saw a Thai AirAsia flight attendant scalded with hot water and noodles erupted when four women seated in two adjacent seat rows came to blows after one of the women’s babies began to cry. Pursuant to the child’s relentless crying one of the women took to complaining to the 27 year old mother, Chan Juang Sung who in turn took exception at the allegations of disruption thrown at her. As the situation escalated, the two complaining women reclined their seats fully backwards, serving to aggravate matters further. From there a scuffle ensued, with one of the women hitting on her head on the overhead locker, until cabin crew managed to step in and separate the women. One passenger Xiong Wan, 45, who would witness the confrontation would tell: ‘I was sitting right next to them when they started telling the woman to shut the baby up. ‘She started shouting back at them and before I knew what was happening she leant over the seat and punched one of them. ‘They then started hitting her and all hell broke loose. Fortunately the flight was only a short one and all four women involved would be interviewed by Hong Kong police upon landing. Offered Air China spokesman Daio Weimin: ‘Passengers cannot behave like this.